An interesting photo has been added to our (Fast Food News') Flickr group, Frightening Fast Food. "The store manager tried to tell me that it was nothing and was quick to grab it from my hands and throw it away. Offered me a free piece to replace it ... yeah, right ... last time I'll ever step foot in KFC ever again. Even tried to contact their corporate office to file a complaint and never get a response." Frankly, I can look at it any longer to try and figure out what it might be because I'm starting to feel sick, but you go ahead and try. He has many more photos of whatever it is in his photo set on Flickr. Wow that's disgusting. Imagine that picture in the hands of El Pollo Loco's advertising team. Tumor. Cancer? With all the chickens raised and processed for KFC, Tyson, and others, I am surprised that such things are n't discovered more. We are, afterall eating meat on the bone of what used to be a living animal. These animals can have as many if not more (hormone-added) maladies as we do. How much of this type of thing do you think is in your ground and processed meat products? Glad I didn't come across this in my KFC last night. It's just a weird looking piece of grizzle. You are eating a DEAD, FRIED animal, that was kept in a area with lots of other animals. If you eat meat/poltry/fish expect such anomalies. Quit being "holier than thou", especially if you're eating these foods!!!! That just looks like a half-developed chicken fetus to me. Not good, but not exactly extraterrestrial. You can see the beak and everything! Did anyone notice the blood vessels running through the item in question? I guess you haven't seen cooked coagulated blood before. Very common occurrence, you just happened to notice it. If you'll think about it that was once a living breathing animal and most of them have blood running through their circulatory system. Sometimes the blood vessels can break and they bleed. When it is kept internally it can be called a bruise. I have similar pictures to this of a piece of chicken I got at my local KFC about a year and a half ago. I just about threw up when I saw it, and I have not returned to KFC since that experience. Afterwards though, I was told by several of my friends that it is not all that extraordinary and this picture seems to prove that. This reminds me of why I am a vegetarian. Yeah that is so nasty. Same thing happen to me when I went to Checkers and found a live bug in my sandwich. I almost took a bite too. And the manger tried to say that there was no bug in my sandwich when I handed to him. Did not even say sorry. Just gave me a refund and that was the end. I call corporate but still nothing. Always look before eating. its actually a chicken's foot. if you're chinese, we eat something called "phoenix claw" which is basically the chicken's legs. the black thing is exactly what "phoenix claw" looks like. 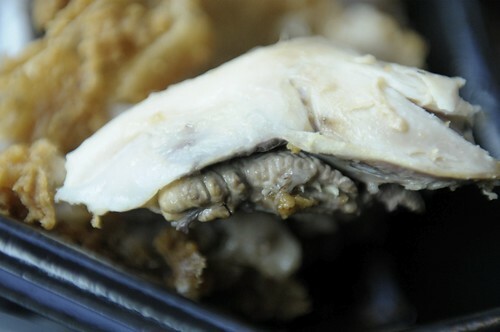 its realy a chickens head.if u take all the fried skin of the suposed thigh u can clearly see theres a spine and a eye socket.what u had in ur "thigh" was a brain.My girlfriend and i had got kfc one night and i bit into the spine....needless to say im not eating there anymore. it's a kidney. fast food restaurants split the chicken quarters at the back of the chicken, to make the piece look bigger, and the kidneys of a chicken hang out right at the spine. it's also delicious, if you're into that kind of thing. being raised cajun, i am into that kind of thing, along with livers, gizzards and hearts. delicious. KFC's 11 Herbs and Spices Revealed? Chipotle to Promote Film "Food, Inc."!